Every Atlantic 10 season has its sleepers, but some are more obvious than others prior to the start of the season. Usually you have 3 or 4 frontrunners, a few teams that will likely take a step back, and anything goes with the rest. This year, however, it seems almost any team could be labeled as a sleeper. Most predictions have Davidson and Saint Louis as the frontrunners, but after that, everyone is left scratching their heads. As we chug along this offseason and painfully wait for the start of hoops in November, let’s look at 3 Atlantic 10 teams that could be major sleepers. Duquesne, in my opinion, has been labeled as a “sleeper” so often this offseason, that it’s almost grown out of that label. I actually believe a lot of fans expect the Dukes to have one of their better seasons in a long time. The Dukes bring in quite the amount of size this season, meaning they could be one of the more dominant teams in the league on the boards. Freshmen Dylan Swingle and Gavin Bizeau both stand at 6’11′”, and sophomore Eric Williams Jr. is a beast crashing the glass considering he’s only 6’5″. Duquesne ranked 47th nationally last season in offensive rebounding percentage, and I’d expect that rank to rise this season. However, with an effective field goal percentage less than 50%, this team will have to make shots in order to capitalize on second, and even third, chances. 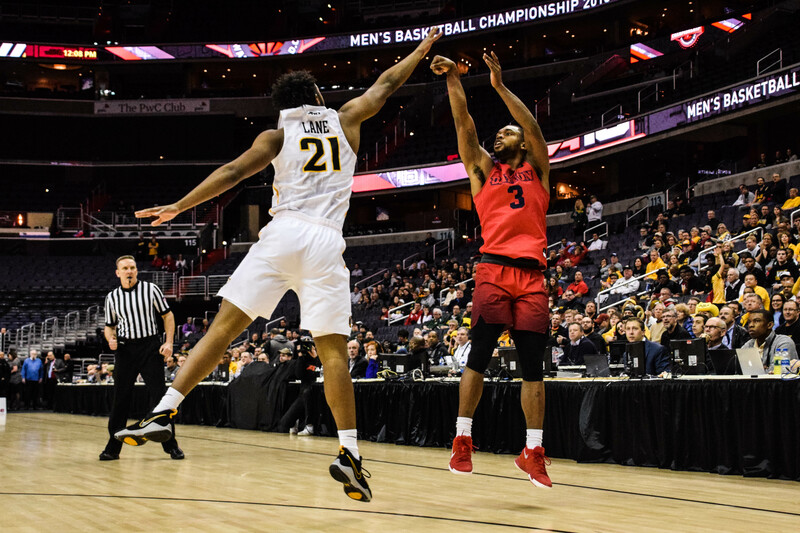 I look at Duquesne as a team that will rely heavily on Mike Lewis II and Eric Williams Jr. to work with the young talent and lead this team to a strong A-10 finish. Both have some strong experience under their belts, and without the help of Rene Castro-Caneddy or Tarin Smith, the backcourt will be green. Give this team some time to adjust though, and I think Keith Dambrot has a chance to finish in the top 5 — or better — in the Atlantic 10 come March. It’s easy to discount a team when it loses a star core of senior guards as well as a head coach who made 2 consecutive NCAA Tournament trips. However, I wouldn’t count out the Rams just yet. Jeff Dowtin seems poised to lead this team back to the top of the Atlantic 10 in the next 2 seasons, as he’s gained plenty of postseason experience, as well as a starting role as a freshman and sophomore. He had the best assist rate in the conference last season and was very protective with the ball, coughing it up just 1.3 times per game. Given his distributive abilities, the Rams just need some knockdown shooters and bodies down low. Fatts Russell is one of the most explosive players in the conference, however, shooting less than 30% from three last season is something that could be improved upon heavily. Losing Jared Terrell as a sharpshooter hurts, and E.C. Matthews always seemed to hit the clutch shots when the Rams needed them. Russell is going to have to do more as a sophomore. In terms of big bodies, I’ve been impressed with Cyril Langevine’s development, especially in the NCAA Tournament where he had a pivotal game against Oklahoma in the first round. Jermaine Harris may be the best freshman in the Atlantic 10, and he’ll add significant size to help replenish the loss of senior Andre Berry. David Cox is going to have his hands full in his first season as URI head coach; however, I think the Rams have a chance to make a run at the top 4 in the league this year. I actually think Dayton might be one of the biggest sleepers in the league when you look at the pure talent on this roster. Josh Cunningham has a sneaky good chance at making a run for Atlantic 10 Player of the Year, and I’m not sure there is a big in the league that will be able to contain him. Jalen Crutcher had one heck of a freshman season and could really make strides as a sophomore. Add in the talents of freshmen Dwayne Cohill and Obadiah Toppin, and I truly think this Dayton team could make some noise. Check out the latter’s athleticism as he puts in some work over the summer. Dayton struggled in late game situations last season and was probably much better than its 14-17 record suggested. Despite losing some players to the transfer market and Kostas Antetokounmpo to the NBA, there are plenty of guys left for Anthony Grant to build a program around. In fact, Josh Cunningham has the talent to be the anchor of this team and shock the league in a year where not much is expected of Dayton. Coach Grant took a lot of criticism last season, and this will be the year for him to answer to that.